Conveying big polysyllabic words: Mark was trying to impress his classmates in by presenting sesquipedalian versions of well-known proverbs for them to interpret. The sesquipedalian contents of some scientific and medical definitions in dictionaries can be very frustrating for most people to comprehend. Jason was a person who loved to impress people by using sesquipedalian terms; even though it tended to confuse them and it hindered his ability to communicate what he wanted them to know. The practice of using, long and obscure words in speech or writing: "The senator's speech was sprinkled with sesquipedalianisms which confused reporters and other members of the audience because he was speaking with many incomprehensibly big words." You may see many examples of sesquipedalianisms with solutions, starting with Group 1-17, by going to sesquipedalia verba. A person who uses excessively long words: "The vocabulary class had a contest to see which sesquipedalianists could come up with presentations of simple proverbs that have been turned into multi-syllable words." The practice of using abnormally long words: "The famous orators, who were famous for their sesquipedalties, engaged in verbal debates as they tried to use longer words than their opponents." A hatred or a fear of big words: "Catherine's English essay instructor had a sesquipedalophia that she instilled in all of her students, urging them to use vocabulary contents that are easy to read and to comprehend." 2. An animal having a whole or uncloven hoof. From Satires by Horace. 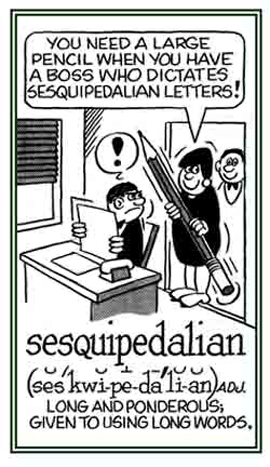 It also means, "effortlessly" and is the equivalent to the English expression "I can do that standing on one foot." A person with talipes, "clubfoot". Showing page 10 out of 11 pages of 160 main-word entries or main-word-entry groups.